An all women’s Afro-pop marimba ensemble, the “Knobs” play traditional and contemporary music from Zimbabwe, South Africa and other areas of the African diaspora. Our music is upbeat, engaging, danceable and will make you rock! 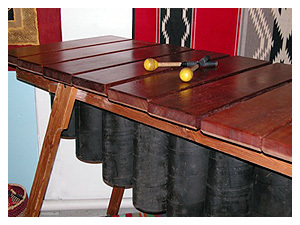 A marimba is a keyboard percussion instrument similar to a xylophone. Our particular style of marimba was developed in Zimbabwe, based on the ancient marimba and balafon instruments found in other parts of Africa. The music we play is largely influenced by the traditional instrument of Zimbabwe, the mbira dza vadzimu, or thumb piano. In addition to the mbira, our instrumentation includes seven marimbas, drums, vocals, hosho (traditional gourd shakers) and percussion. The size of our performing ensemble varies depending on the nature of the event and the constraints of the venue. A quartet of marimbas will provide unique background music perfect for a reception or other small event, whereas the sound of our full, nine-member band will fill a concert hall, festival stage or a celebratory party. Marimba classes are fun for everyone! Anyone who loves this music can learn to play it! Beginning and intermediate classes available for adults and youths. As an all-women’s band, The Low Flying Knobs are committed to supporting women and girls in Zimbabwe, and a portion of our proceeds are donated annually to charities working in Zimbabwe to improve daily living conditions and access to education.